Robyn and I had a great time shopping and you can see the rest of the fun we had by checking out my google + album! It was kind of tough selecting between Numbers, Letters and Wild Animal Adventures Cypher Kids Club Cards, but I chose the animal cards because I thought they'd have the most universal appeal with my kids ages 2, 6 and 14. 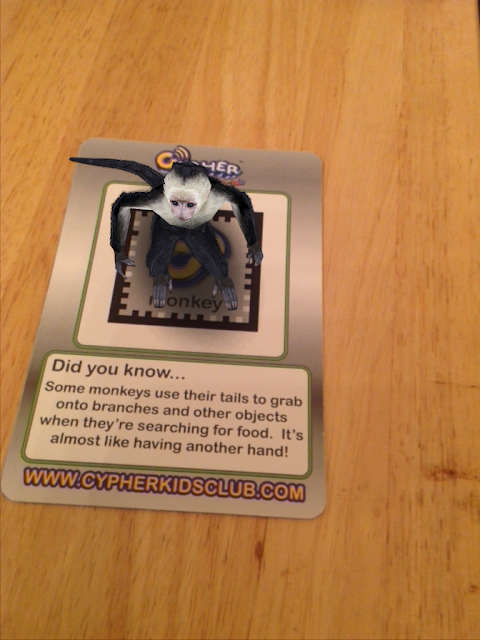 Cypher Kids Club cards are an augmented reality interactive card game that allows kids to interact with digital animals on their iDevices. Cypher Kids Club cards are compatible with iPhone 3GS, iPhone 4, iPhone 4S, iPhone 5, iPod touch (3rd generation), iPod touch (4th generation), iPod touch (5th generation) and iPad. Requires iOS 5.0 or later. This app is optimized for iPhone 5. Each card allows some interaction with the animals after the initial information spiel is over - for instance the tree frog sticks out his tongue and eats a bug, and the monkey jumps off the branch he's on and disappears, only to reappear and jump off again. For us, the cards are on point with Liam's learning and interest levels and Erik enjoys watching the vignettes too. Robyn was, as an older child, hoping for more depth of information and more interaction. These cards will definitely intrigue your 3-7 year old, but I think that older children will find that the cards are too rudimentary for them to use more often, and with a $29.99 price tag, you don't want to buy a package of cards for a one use deal. Check out the #CypherKidsClub website, twitter and Facebook pages for more on this fun, new interactive apptivity!